After a lengthy stay in early access, Boneloaf's brawler is ready to land a punch or two. We've been playing Gang Beasts on and off for a number of years, taking a look whenever we saw it running at an event, and then later via early access on Steam. Now the game is finished and out on PC and PlayStation 4, and it was on Sony's console that we took one last look before writing up this review. For the uninitiated, Gang Beasts is a multiplayer brawler with plasticine figures who smack the crap out of each other, hurling each other off of buildings whilst trying to avoid an untimely death of their own. In many ways it's the perfect party game, and it can provide moments of total hilarity as friends become foes thanks to some quirky levels designed to house chaotic action. With four friends and a few beers thrown in for good measure, you're guaranteed plenty of laughs. However, that's only half the story when it comes to Gang Beasts, which offers silly fun, but not a lot else. For every player you take away from the equation, the chaos decreases and so does the enjoyment that it offers. Our last session was played with just two players, cycling through the various maps and costumes, but even though we regularly laughed out loud, goading each other as we fought, it simply didn't enthrall us in the same way as it did when we got stuck in with a full complement of players. The fewer combatants, the more noticeable the game's shortcomings. The main issue is the combat itself, which is very loose and unpredictable. It doesn't matter how many times you press punch, you're just not going to land the hits you're hoping to. That, however, is also kinda the point. 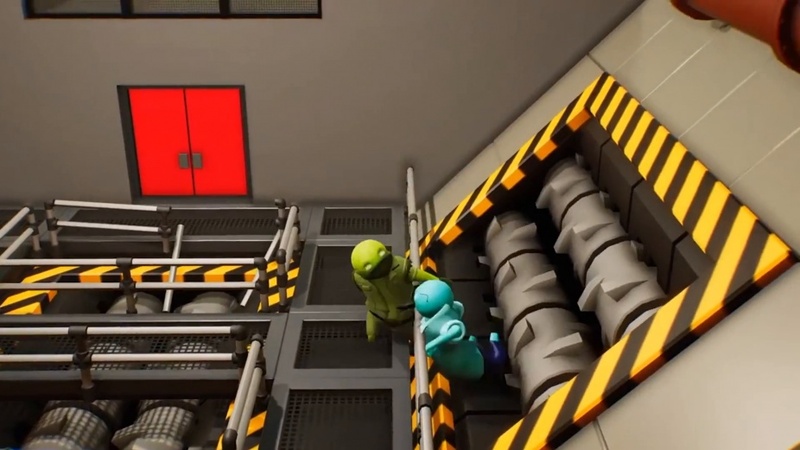 Gang Beasts is very accessible, but that's largely because skill takes a backseat, and once you've learned the simplistic controls there's really not a lot to it; flailing arms try and connect, opponents grapple, and losers are thrown unceremoniously from buildings and ledges. Much of the time you'll be grabbing your opponents and trying to wrestle them over the edge of something, hoping that they can't grab for safety or that someone else doesn't interfere with your throw and put you in an equally precarious position. Many of the levels have been built to facilitate this kind of action, and it works well enough, even if the sticky controls make a victorious throw more about luck than ability. There are a few modes to mix things up. Football has players grabbing a ball and sending it towards goal; Waves is a co-op PvE mode filled with AI-controlled minions that need to be cleared; and Gang has two teams go up against each other and aim for collective glory. The main attraction is still Melee, though, whereby players scrap around a selection of simplistic maps. None of the modes are particularly complicated, but then again, they don't need to be. While the camera angles can sometimes frustrate, the load times between rounds is pretty decent, and there are enough levels to keep things feeling fresh as you cycle through. Whether you're fighting on the roof of a moving truck or grappling over a meat grinder, there's a constant flow to the action thanks to the shifting environments. Some are a bit trickier to get to grips with, and there are environmental dangers to take into account, but overall you'd have to say that there's a solid selection of levels, many of which come complete with destructible elements. Much of the game's charm comes from the visuals, which are simple but effective in dehumanising what are actually very violent actions. The clay-like models are hilarious, made more so by the sluggish and erratic movement that defines them. Over time more and more cosmetic items have been added, but perhaps more customisation options could have been added for even greater variety. Like the number of levels, there's a fair number of costumes and styles, but more would have been even better if you ask us. You can venture online if you so wish, but really the charm of Gang Beasts comes from seeing the anger/despair/humiliation of your opponents in real-time. As a party game, it's a great option if you've got a house full and you're looking for something to play that's both accessible and entertaining. The problem is that once you look beyond that particular scenario, Boneloaf's brawler doesn't have a huge amount to offer, and we certainly wouldn't recommend it to a solo player (nor someone who's trophy-focused as there's no platinum). 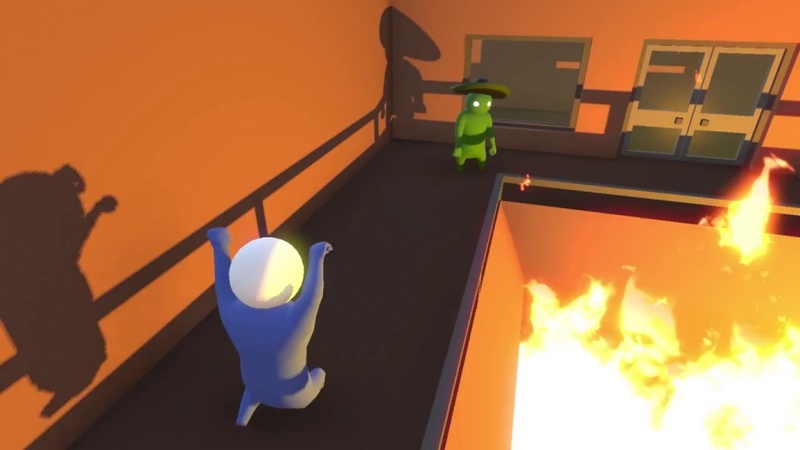 If you've got willing friends, though, Gang Beasts can be an absolute blast. The excitement it offers comes both despite and because of its limitations, and if you've got some buddies coming over and enough controllers to go around, it's well worth picking up, just don't expect the fun to carry on when everyone has gone home. Fun party game that offers lots of laughs. Limited range of modes, controls are too loose, not as much fun with fewer players.